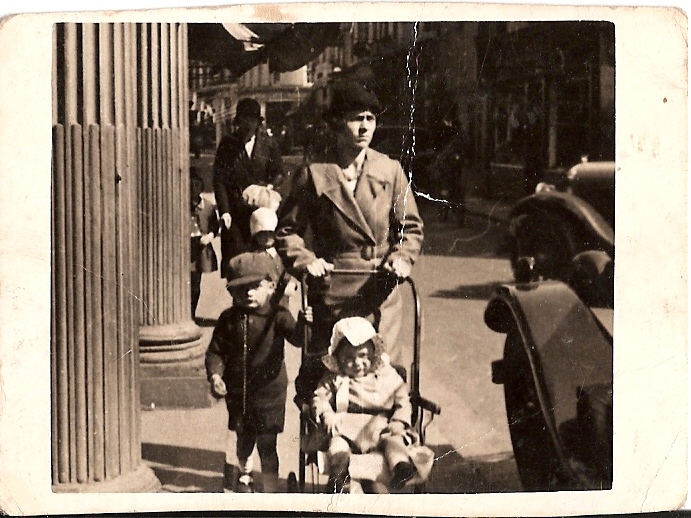 My great grandmother Florence Anna Gallienne pushing the pram. The name Gallienne is recorded as early as the 1300’s in the Assize Roll of 1309. The Assize Roll was held every 3 years in Jersey and was conducted by justices from France. The word assize refers to the sittings or sessions of the judges, known as “justices of assize”. The old french word was ‘assises’. It took a while, but I have since discovered that the origins of the Gallienne members of my family came across from Guernsey to Jersey at the turn of the century 1900. Thanks for stopping by My Channel Island Ancestry. The surname Gallienne also comes with a ‘Le’ in front of it as in the English author/poet Richard Le Gallienne. I know very little about Gallienne’s that have emigrated to the USA. But I do know that Gallienne is the Guernsey version of spelling, which originates from France. My mothers family were Galliennes – Edward and Marie. They came over from Guernsey to Jersey and most of their children were born in Guernsey and originaly had French names which they changed to the English version – Henri to Henry. My great aunt Clementine I believe stayed in Guernsey. Thank you for stopping by My Channel Island Ancestry. I have not come across an Edward or Marie Gallienne in my tree as of yet. But I never know what I may find in the future, so I will keep your family names in mind. I have found my Gallienne’s to be quite a tricky family to research so I know very little about them. Gallienne is definately a common Guernsey surname and many still live in the island today. Hi , my name is Manon Toutant , i am a french canadian born in Sept- Iles, Quebec. My grand mother ‘s name is Gallienne. From what i have learned, my ancester came from Jersey island. I may visit the island this summer and try to meet some ” cousins”! Hi I am researching my Gallienne roots in Jersey. My G G G Grandfather was a sailor, eventually a captain his name was George Gallienne, he had a brother Phillip. They both immigrated to Australia. George married Amelia Dodge in Sydney Australia. Hello I am Gregory Phillip Gallienne , my grand farther was George Gordon Gallienne and his father was Capt John Phillip Gallienne . He lived in Bairnsdale Victoria Australia. As 1st mate on the steamer Tanjil he saved a life and was presented with medal in 1880. Later on in 1889 as a Captain he and his crew on the paddle steamer Emu made history when for the first time set out to sea at the new Lakes Entrance sea way making three trips to tow ships in from stormy weather.This was done without government instructions but in effect opened the new entrance for shipping.The crowd whilst watching the event cheered every pass and the Emu fired rockets up into moon lit night . My father Adrian Hudson Gallienne had a brother Phillip they lived near Melbourne Aust. Hope this is of help Im keen for any more info you may have found ? P S; Capt J P Gallienne was lost at sea in his schooner off N Z 1904. Thanks for stopping by my blog. Thank you too for sharing your story with me. I am unaware of a Captain John Philip Gallienne but will certainly keep an eye out for him now that I knowof him. Do you know if your ancestors came from the Channel Islands, and if so which one? Captain JEAN PHILLIPE GALLIENNE or John Phillip was the son of Matthew, Matthieu. Both Matthew and most of the family went to Quebec whilst John went to Australia as mentioned above. Matthew was from Torteval, Guernsey and went to Jersey before going to Quebec. Matthew married twice Susanne Helleur was his second wife Fanny Gaudion his first. John Phillip was from Fanny. Anne Jane was from the second marriage as stated above. Thank you for stopping by My Channel Island Ancestry and leaving a comment to fill in more details for other readers. Sorry correction Fanny was the second wife married 1844 Jersey and Susanne the first married 1827. So happy to see that i have “family” in Australia. I live in Quebec city but i grew up on the north shore of province of Qubec where the Gallienne family came for fishing. Thanks for stopping by my family history blog. Do you know if your Gallienne ancestors were from Guernsey, Jersey or France? Thanks for stopping by my family history blog. As far as i know I have not found any connections with the Le Gallienne’s. I am not too sure how long mine were in Guernsey before they came from France. Gallienne is also very much a Guernsey name and that is the only place I have found mine to date. Have you got any information about Hesper Le Gallienne, Richard Le G’s other daughter? HI,My relative is Ester Gallienne/Pryor and she married Nicholas William Moullin. Her father was Thomas Gallienne and her mother was Marie Le Page and they married on the 29/6/1745. Esters daughter Susan married George White and they moved to Australia with their family in 1841 on the William Turner ship. Thank you for visiting My Channel Island Ancestry blog. I have checked my tree and at the moment do not have an Ester Gallienne. I do have a Thomas W. Gallienne born 1837 but that is all the details I have on him. Do you know the birth date of your Thomas? Do you know where in Australia they moved to as I am currently in Australia and maybe able to do some research.